September 9, 2000. 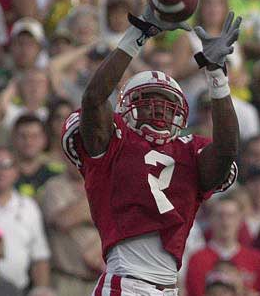 A highly regarded Wisconsin team welcomed Oregon to Camp Randall Stadium on week two of the 2000 football season. Oregon’s Joey Harrington was one of the nation’s best quarterbacks, but on this day he was outplayed by one of the best cornerbacks in the country — Wisconsin’s Jamar Fletcher. Fletcher intercepted three Harrington passes, including one that helped secure a 27-23 come-from-behind victory for the Badgers. Fletcher was named the best defensive back in college football at the conclusion of that season, but despite his football success, he’s most proud of what he’s doing now in Broward County, Florida. The 2000 season eventually took a wrong turn for the Badgers, when they lost three straight games to drop from their #4 ranking all the way out of the top 25. They rebounded with five straight wins to end the season, including a victory over UCLA in the Sun Bowl. Fletcher is considered one of Wisconsin’s greatest defensive backs, and still shares the school record for career interceptions with 21. Shining Moments are sponsored by Marshfield Clinic.